← The Elephant in the room. Whew! It has been a long year. While I have enjoyed the journey, it has been a great deal of work. If you know me, I have a lot of ideas, so trying to get them all into a single book was a HUUUUUUGGGGGGGEEEE challenge! But, alas, it came together and Amazon posted the book live! Who might value reading it? 2) Schools and decision makers who are still trying to figure out if/when/how Computer Science even fits into their offerings. 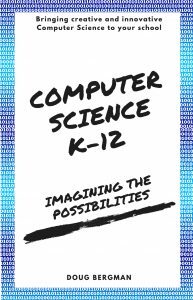 I spend time in the book describing exactly what Computer Science is, citing numerous examples of what it looks like in the real world, as well as what it might look like in education. Part of the reason why we are struggling to figure this out is simply lack of understanding, or misunderstanding. I think once people see what it really is, they will “get” why it is crucial. 3) The experienced CS teacher who is just not getting the response from students and not seeing the engagement that he/she knows he/she should be getting. Our CS classrooms should reflect the same dynamic, interactive, and involved spirit as the technologies we are using. This is where my program has had tremendous success and we have seen our program grow 6X in size!